This car, Lot 32, sold for $110,830, including buyer’s commission, at Artcurial’s Paris, FRA, auction on April 8, 2018. Four-passenger Ferraris were often the most expensive model in a Ferrari production series. The reason is simple: Four-passenger models have more content than 2-passenger models. They have more metal, more leather and more luxury features. They are designed for everyday use and often are used in that manner. They go to work, they take the kids to school and they get parked wherever there’s space. They usually see higher use than the 2-passenger models and often show more wear. Accordingly, they depreciate faster and are the entry models of the Ferrari world. Once Enzo Ferrari decided to supplement his race-car business with production models, it didn’t take long to add a family-friendly model to the lineup. A couple of 2+1 and 2+2 versions can be found among the earliest iterations, with a real production model, the 250 GTE, coming to market in 1960. The 250 GTE — the E denoted the use of a 508 E chassis — was introduced to unprecedented acceptance. The GTE allowed access to the Ferrari experience to the client with a family or one who required a larger car. Calling the concept a success would be an understatement, as in an era that produced such important models as the 250 Lusso, 250 California and 250 GTO, nearly 40% of all 250 GT sales were GTE models. The success of the 250 GTE guaranteed a position for a 4-place model in future Ferrari lineups. A 330 GT 2+2 followed the GTE, which was subsequently replaced by the 365 GT 2+2 — also known as “The Queen Mother” due to its bulk. In 1972 a new model was introduced that would define 2+2 Ferraris for the next 17 years. The 365 GT4 2+2 was introduced in 1972. 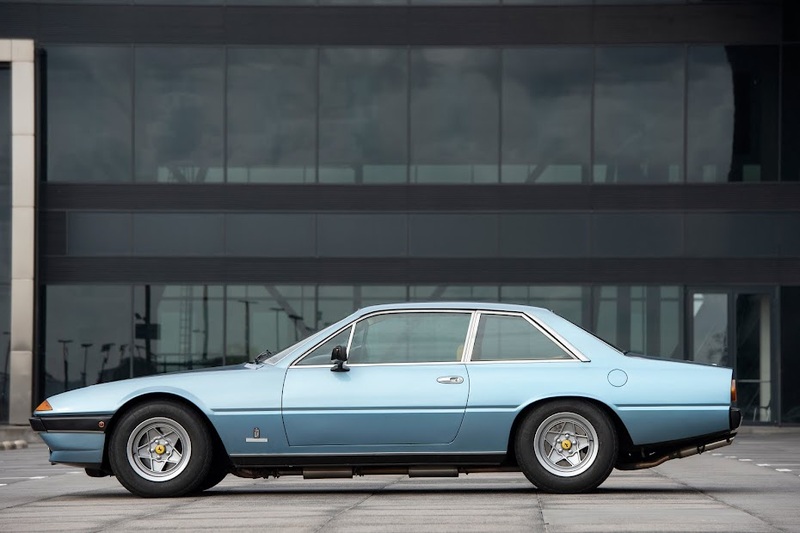 The angular body penned by famed Pininfarina designer Leonardo Fioravanti was a major departure from the compound curves of previous Ferrari models. The traditional oval opening and egg-crate grille were replaced with a horizontal opening and a slatted grille. The 365 GT4 2+2’s plush interior, dominated by a large center console, was a pleasant upgrade to the already luxurious interiors of previous 2+2 models. Power for the 365 GT4 2+2 would come from a 4-cam, carbureted 4.4-liter, 340-hp V12. Like the 365 GT4 2+2 itself, this engine would evolve over the next 17 years, but from the beginning it was a dependable workhorse. 1972 would see the 365 GT4 2+2 evolve into the 400 GT and 400 GTA. The GTA would be the first production Ferrari offered with an automatic transmission. The models kept the basic cosmetics of the previous examples, but they were powered with a 4.8-liter version of the 365 GT4 2+2 engine. The new engine was still rated at 340 horsepower but was re-engineered to work with an automatic transmission. The next update was in 1980, when the 400 lost its Weber carburetors to a Bosch fuel-injection system. The new 5-speed model was christened the 400i, while the two-pedal model was called the 400 Automatic i. The fuel injection made the 400i more emission friendly, but it severely crimped horsepower. Rated at 310 horsepower, the 400i may have lost some of the snap of the 400 GT, but it still maintained respectable performance. Like the previous evolution, some cosmetic changes accompanied the mechanical upgrades. The seats were redesigned, and the interior trim got new fabrics. In an attempt to keep up with the latest technology, the 400 GT’s 15-inch wheels and Michelin XWX tires were replaced with 415-mm (16.3 inches) wheels mounted with Michelin TRX tires. The switch may have seemed like a good idea at the time, but the metric wheels and TRXs never caught on and went the way of Sony’s Betamax videotape system. The final model of the series was the 1985 412. A revised 5-liter (412 cc per cylinder) version of the original 4.4-liter Colombo V12 replaced the 400’s unit. A 5-speed and an automatic transmission were offered. The new car’s 16-inch wheels and conventional performance tires replaced the unloved TRX combination. The 412 was a nice improvement on a car that was already top shelf. To shift or not to shift is the 400 paradox. The 400 was the first production Ferrari to feature an automatic transmission. There was far less controversy about the move than there is about paddle shifting today. The 400 was a big car intended for cruising rather than sporty driving. An automatic transmission was a natural fit, but the implementation left room for improvement. 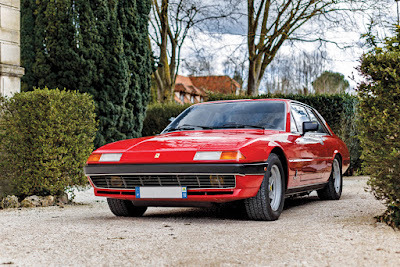 Ferrari chose a GM 3-speed Turbo-Hydramatic for the job. It was a beefy unit designed for engines up to 500 cubic inches. The unit could be found in Cadillacs, light trucks, and even in Rolls-Royces. The problem was, Cadillacs and Rolls-Royces didn’t go 150 mph. Take off from a stoplight, lift your foot at 35 mph and the transmission shifted to the same gear that was good for the next 115 mph. A stab of the throttle would put you in a lower gear, but let up on the throttle and you were back in third. The 5-speed option solved the gearing issue — but at a cost. If you bought a 400 for the commute to work, sitting in traffic holding down a clutch probably made you miss the Mercedes. Artcurial’s 400i was a 5-speed model. It had only been used for around 13,000 miles and had only one owner from new. It had been retired when the owner moved to a more driver-friendly V12 BMW. Our subject 400i showed signs of neglect, with a nasty engine compartment and at least one spot in the carpet that looks to have been eaten by insects. It also needed service and a set of expensive tires. SCM’s Pocket Price Guide shows the median value for a 400i is $40,500. A scan of SCM’s Platinum Auction Database shows lots of sales, but few breaking $50,000. Our subject 400i sold for $110,830, which is an outlier — but not crazy. RM Sotheby’s $416,000 sale of a 400i last fall was crazy, but that one-owner, ultra-low-mileage 400i had belonged to Keith Richards of the Rolling Stones. Rock-god Ferraris can wreak havoc with car valuations.